The club was founded on 6 March in 1914. thanks to the students of Novi Sad. As the world is getting ready for the first world war, a group of young people moved by love for the then little popular game, decided to establish a football club that would represent the Serbian community in Novi Sad. In the name of the Novi Sad club Vojvodina name is taken, in order to emphasize the memory of the political subdivision Duchy of Serbia where Serbs, at least on paper, get equality in the Habsburg Empire. One of the founders of the days in today Temerin street in the village of Tehnometal, were as textile industrialist Milenko Sijakov, as a university professor Vladimir Milicevic, as a chemist Milenko Hinić, as lawyers Radenko Rakic ​​and Kamenko Ciric, Gojko Tosic and others. 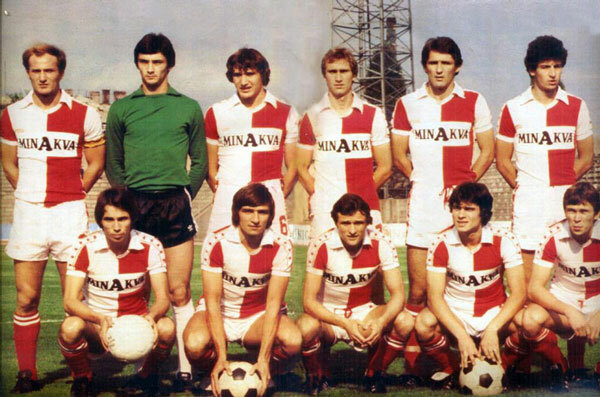 After the war, from Prague passed a set of jersey FC Slavia, who remained a trademark of Vojvodina to the present day. In 1924, together with the club Judas Maccabi, Vojvodina City stadium "Karađorđe," according to the draft engineer and president of the club Daka Popovic. Until then, both have been played at the stadium at a spa, which belonged to the Novi Sad club UTK, who gathered the Hungarian youth. The first match FK Vojvodina played in Kovilje, on the playground, " ŠAJKAŠ ". For the red and white then played mostly pupils and students. Vojvodina won the game 5-0. However, the next match, Novi Sad team played until 1919, after the war. Although an occasional participant in the first division in the interwar period, serious role in the major leagues, Vojvodina began to play the fifties of the 20th century. The first serious result is 4 place 1952/53. In the following years, Vojvodina is regularly winning favorite, but failed to win the title. In 1955. The election is a place in the Mitropa Cup (precursor to the UEFA Cup), and others are remembered victory against Roma in Novi Sad with 4:1 and 5:4 in Rome. And next year, Voša participated in this Cup and achieved remarkable results. Then the golden generation has gained great support from her playful game, and the most famous players were Vujadin Boškov and Todor Veselinovic. At the beginning of the 60s, there was a change of generations and already in 1962 Vojvodina became second. Finally 1965/66 Voša took the first title. The most famous players of the team were Ilija Pantelic and Silvester Takač. In the European Cup, Voša reaches quarter-finals, eliminated from Celtic Glasgow, which in the same year won the Cup, and only defeat was inflicted just Vojvodina in Novi Sad. In the 70's, Vojvodina was often at the top of the table, and in 1974 / 75 in the last round dropped the title, and remained in second place. 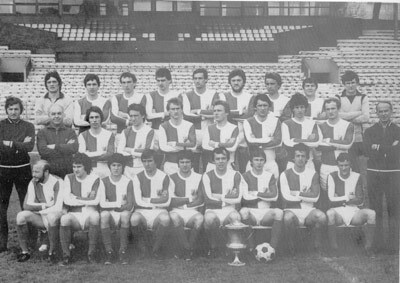 In 1977 Vojvodina won their first European trophy, Mitropa Cup, defeating the group in front of the Vasas, Fiorentina and Sparta Prague. The 80 's was a crisis, culminating in relegation to the second division in 1985/86. 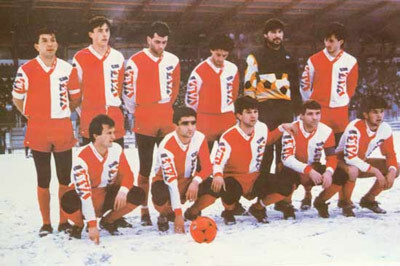 Followed by a reconstruction team, which express back to the First Division for two seasons, this new team of Vojvodina won the second title of 1988/89, In one of the last season before the breakup of Yugoslavia. In 90's, Vojvodina welcome to reduced First League of FR Yugoslavia. Initially, Vojvodina is considered a perpetual third, took the fall title in 1994 and almost up to the trophy. From major success and a place in the Cup final in 1997, as well as the final Intertoto Cup in 1998, and after various crises, strikes a player and change management, the relative stability followed in 2006. In the season 06/07 Vojvodina is the third in the Super League and played in the final of the national cup, and thus provides a place in the UEFA Cup. Season 2007 /08 team started against the Maltese team Hibernians which was easily won at home 5-1 and away 2-0. In the next qualifying round lost to Madrid Athletics, 0-3 away and 1:2 at home . For the next season 2008 / 09 The club most successful season championship since the breakup of Yugoslavia, finishing the season in second place, behind the Partizan and Red Star in front, but it had the same effect in Europe as in the previous season. In the season 2009 / 10th The club was not as successful in the championship, having finished 5th, but reached the finals of the Serbian Cup, where they lost to Red Star 3-0. The 2010/2011 ends at 3rd place in the Super League, while in Cup of Serbia reached the final. The final was marked by major scandal when players of Vojvodina in the 83rd minute, left the field with the score 2:1 for Partizan, after several controversial decisions of the referee, later match was awarded 3:0 in favor Partizan. Vojvodina was then cheered on the away game by 7000 fans.